This week Soulful Sunday explores the power of aroma. Aromas have the power to transform our emotional and energetic state. In a fun word association, miracles and gifts are called heaven sent while certain aromas are considered heavenly scents. Smell is our most primitive sense and affects our limbic system and areas of the brain associated with desire, memory, and emotions. If you’re like me, I bet certain food like baked cookies trigger strong associations with family, childhood, and happiness. Science tells us that aromas can cross the blood-brain barrier meaning that they can quickly enter our circulatory system to impact our body. Aromatherapy is the science of using essential oils to stimulate certain parts of your brain to influence mental and physical health. Essential oils have been used for thousands of years for their aromas and natural healing powers. In my 30s I discovered the benefits of essential oils to calm, center, heal, and enjoy. Different oils have different properties. Lavender is known for its calming impact while jasmine is a stimulant. Here is a good introductory article on the power of aromatherapy. Roses have been calling to me lately. Maybe it’s time to stop and smell the roses! As I previously wrote in Ode to a Rose, roses feed my mind, body, and soul. Interestingly, according to Michèle at Michèle’s Organics, rose oil vibrates at a higher frequency associated with love, heart, and spirit. Sometimes I’m transported to another time and place where I become one with their heavenly scent, transcending the moment. I’m very sensitive to aromas (pleasant and not). They affect me deeply and can trigger strong feelings, memories, and sensations. Thankfully, roses always stir up good vibes with their smells. 🙂 I love the smell of many other flowers, including peonies, irises, and mimosa and magnolia blossoms. What smells do you love? May your week be full of heavenly scents! Same to u too Brad. A post that’s both beautiful and useful. 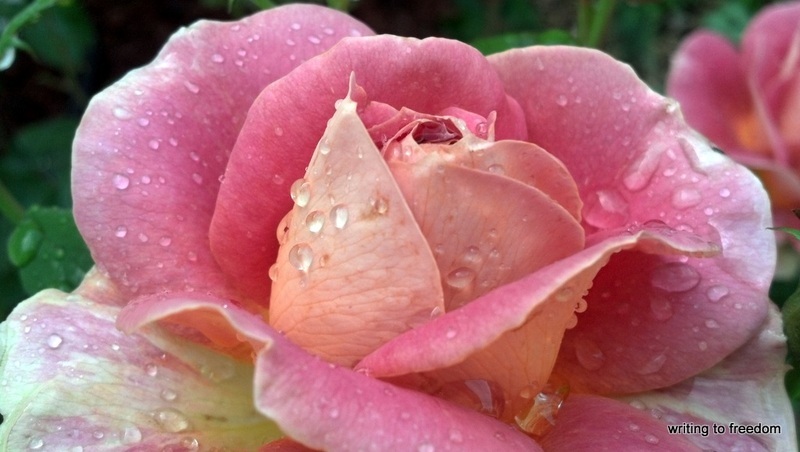 That photo of the rose has to be one of the loveliest I’ve seen. And I like the “sent of heaven”. Thank you Cynthia. I hope you breathe in much beauty and heavenly scents this week. I am very sensitive to smells and for sure, they can stimulate memories. Sometimes it can be shocking when the feelings appear so strongly. How fun that we’re both tuned to roses today. I hope your week is full of heavenly scents. I’d like to have a better sense of smell, but a couple of my favourites are the smell of the sea and peaches. I’ve been thinking of getting a climbing rose for my yard this year. I love the smell of the ocean too Andrea plus the energizing impact of the ions! Please enjoy it for me! One must always make the time to smell the roses! my nose is happy to know, Brad! Hmm, I’m going to have to re-look at rose scents. I don’t have a negative association with them, but I shied away from embracing the scents. It’s time to take another look after reading this. I have discovered essential oils now in my 30s. Hehe. They are powerful in their capacity to heal. I am awed by what they can do. Ha, ha. Another great one! A sent-sational post, Brad! I enjoy essential oils — although my allergies prevent me using many of them, even sandalwood, which I love. Sometimes I can handle a teeny tiny amount of that one. Rose or jasmine, rarely even when used sparingly. So, my favorite is probably rosemary. It wakes up the brain. I find it refreshing. Lavender is one that I use frequently, since I get a lot of headaches. It doesn’t bother me the way most other florals do. Have a marvelous Monday. Hugs. The second I opened this post and saw the rose, I literally smelled it…strongly enough I looked around the room to see if my wife had picked a rose and had it in a vase. Then I read your post….enough said….it works! That is a wonderful confirmation Kirt! Those all sound wonderful Harula. You just sparked my imagination too, and I took a trip to the Mediterranean! Thank you. A rose garden sounds wonderful! I miss my gardens.